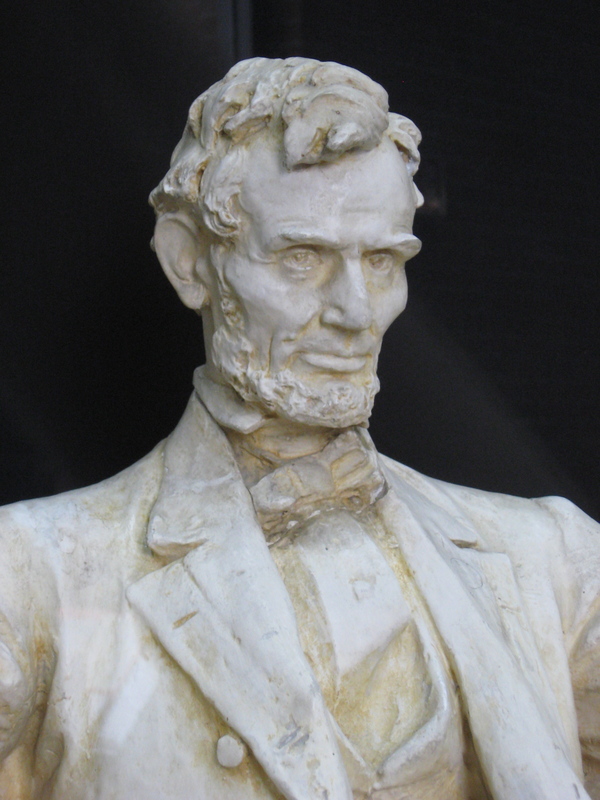 One of the goals of the Abraham Lincoln Institute for the Study of Leadership and Public Policy is to encourage the study of Lincoln’s leadership style as a way to help emerging leaders apply these insights in practical ways. As part of that mission, the institute’s director, Dr. Charles Hubbard, teaches courses on Lincoln and leadership which are offered to candidates in Lincoln Memorial University’s Ed.D. program. We’re going to take a couple of posts to highlight two recent graduates who completed dissertations on the relationship between Lincoln and the study of leadership by asking them some questions about their research. In this post, we talk to Kelli Welborn, who received her degree in May 2011. Her dissertation focused on Servant Leadership and the degree to which Lincoln exhibited traits consistent with this leadership style. How did you become interested in incorporating Lincoln into your research? When I entered the Executive Leadership program at LMU, I was already interested in conducting research around the concept of Servant Leadership, although I had not formally formulated its exact scope. Servant leadership, as conceptualized by Robert Greenleaf, is a unique and exceptional leadership style that is infrequently encountered. During our first weekend class at LMU in the summer of 2009, Dr. Charles Hubbard presented a lecture at the Lincoln Museum about Abraham Lincoln’s ability to work with an eclectic group of cabinet members and generals. He emphasized Lincoln’s capacity to use this unique group of individuals for the purpose of keeping the United States together despite the Civil War. That presentation began my process of exploring what scholars had written or concluded about Lincoln’s leadership style. Interestingly, there was no prior research or visible link made by scholars between Abraham Lincoln and servant leadership. What exactly is servant leadership? The term servant leadership first appeared in an essay written in 1966 to fellow managers by an AT&T executive named Robert Greenleaf. Greenleaf credits the novel Journey to the East, by Herman Hesse, as providing the notion that an organization run on the premise of servant-first could be highly effective and productive. At the core of this philosophy is service to others. The servant leader does not look for ways to make others do what they want, but rather, looks at each individual and tries to determine what he or she can do to meet the needs of others in the organization. Servant leaders possess individual qualities within themselves that facilitate their leading through acts of service. Leadership is something that originates from within. Without these intrinsic characteristics, a leader does not fit the model of a servant leader. These characteristics, as identified by Greenleaf, include an innate calling to lead others with the mindset of being “servant first,” good judgment, courage and tenacity, a strong sense of personal and interpersonal values and ethics, the ability to motivate others to action and personal empowerment, and the ability to effectively communicate. The element that separates a servant leader from others is the moral/ethical component. The servant leader leads with a moral conscience, frequently referred to as a moral compass, which influences the behavior of the leader and those who follow. Servant leaders, as compared to other leadership types, are then able to serve others in a more ethical manner while keeping their eye on the goal regardless of how difficult the circumstances may become. This attitude towards leading by serving others is an intrinsic motivator and at the heart of servant leadership. For the servant leader, leadership is not about the power or position but rather, the desire to lead others. It is an internal charge to go ahead of the followers and show the way. This opportunity for leadership is given to those who are by nature a servant first and keenly aware that their position as a leader is fluid and can be taken away. Servant leaders practice such reciprocity between themselves and their followers. The purpose of leadership for the servant leader is the intentional development of individuals. Robert Greenleaf asserts that a servant leader’s success within an organization is seen in the growth of the followers as individuals and their own service for others. The impact servant leaders have on an organization and their followers is lasting and positive. Leadership through service is not just a way to move toward a goal or vision, but is a way of life for servant leaders. They live what they exemplify and teach. What are some ways that Lincoln exhibited this kind of leadership? Servant leadership has two specific areas that distinguish it from other leadership styles. The first area is sustainability that produces lasting change and may lead to the transformation of others. The second revolutionizes the organization and empowers its people. The American Civil War provided a platform for Abraham Lincoln to demonstrate servant leadership. Two of the most lasting results of Lincoln’s servant leadership are the preservation of the Union and the freeing of the slaves. Lincoln’s commitment to serve the greater good for the most people both revolutionized and forever changed a nation for the generations that have followed. Lincoln’s careful and prudent leadership throughout his presidency produced a radical and transformational change in America. Abraham Lincoln seized the opportunity before him to confirm America’s position in the world as the premier example of a working democracy. Additionally, he extended the opportunity for liberty to all Americans. The agenda that servant leaders set is for the good of the organization itself, but most importantly, for the improvement of the people within that organization. Lincoln’s aspiration to become President stemmed from his desire to serve his country. This suggests that Lincoln did not seek the position of executive leader solely for the sake of power that such an opportunity would create for him. He understood that the Presidency was the ultimate position to serve his fellow Americans and move the country toward a “more perfect Union.” The position of executive leader would provide him with the platform necessary to fulfill this vision for the people and the nation. He recognized that he would have to exercise a position of power in order to accomplish this goal. While this position of power was the catalyst for realizing his purpose for America, it held an aspect of responsibility to the American people as well as to the office itself. Lincoln recognized that the fundamental American values of liberty, life and the pursuit of happiness were possessed by all Americans. However, the culture of 19th century America suggested that only a selected portion of the population was entitled to the opportunity to pursue these liberties. Lincoln set out to challenge the unwritten cultural beliefs held for several generations in America. This leadership task involves uncovering the precepts and held beliefs that contradict the true values of humanity and, in America’s case, the additional belief that the sovereignty of a state superseded the establishment of an entire nation. During America’s constitutional and social crisis, Lincoln set out to awaken the consciousness of America. Post Civil War America has remembered Lincoln’s words of nationalism, liberty and freedom. Furthermore, it gave this country the fortitude to move in the direction that began with the sixteenth president. The 13th, 14th, and 15th Amendments to the Constitution set in motion the evidence of lasting leadership. These permanent changes to America’s Constitution, the rulebook by which the people’s rights were guaranteed, showed the direction in which Abraham Lincoln was leading the country. These changes were evident in the laws that Congress passed. Change had taken place. The ability to continue to pursue a “more perfect Union” in the wake of Lincoln’s exit from the executive office is proof of his servant leadership. Because of Lincoln’s commitment to service and sustainable revolutionary change, Americans continue to provide the example of a working democracy. America’s example to humanity of liberty and prosperity to those who wish to attain it is again evidence of Lincoln’s servant leadership. America’s paradigm shifted under the leadership of Abraham Lincoln. Lincoln’s interpretation gave a new voice to the ideals expressed by the Founding Fathers. The lens he used to interpret the Constitution and Declaration of Independence gave America a greater sense of itself and freedom to a people now and for generations to come. Moreover, two separate Americas are evident. There is the America that existed before the executive leadership of Lincoln; one in which the words of the Founding Fathers were interpreted for the inclusion of some and to the exclusion of four million others. The resulting America that emerged as Lincoln led it through the crucible of the Civil War was one that was inclusive to all who desired the opportunity for life, liberty, and the pursuit of happiness. This America is evidence of Abraham Lincoln as the embodiment of servant leadership. Where do you think he acquired this leadership style? In the literal sense, Servant Leadership is not considered a style of leading that can be acquired. There are components of this style that can be practiced and even learned, to a degree. But the uniqueness of Servant Leadership is that the leader has an innate desire to lead others through serving; to raise the followers to a higher level of moral principles and ultimately their own service to others. I surmise that Lincoln’s leadership style was a natural response to the people and circumstances that surrounded his Presidency. That is not to say that leading was easy for him. Rather, he appeared to demonstrate a natural ability to work through those obstacles and bring together a diverse group of people to forge ahead with his vision for America. Lincoln never joined a church, and as far as we know he never made a profession of faith, but he had a sort of religious sensibility. Some proponents of servant leadership have noted that it shares some ideas in common with Christian principles. Do you agree with this, and is there any indication that Lincoln made any of these connections between religion and leading? I find that it is easy to piece together servant leadership with Christianity, especially when many perceive Jesus to be the ultimate example of a Servant Leader. However, not all Christians are servant leaders nor are all leaders are Christian. So to assume that this leadership style is directly correlated to only Christian principles is a bit of a stretch. They do however, share commonalities. I did not find any evidence that Lincoln used religion to dictate his leadership. However, he was very aware of the importance of faith and its role in the lives of Americans and used that knowledge to communicate more effectively with the public at that time. Many of his writings and speeches point to the fact that Lincoln must have believed that God’s hand was at work in the events that surrounded America during this turbulent times. The mere unfolding of events that surrounded the Republican Convention of 1860 would lead people to conclude that a Divine Power was at work for Lincoln to receive the nomination for President. The political landscape had many potential candidates who had more leadership experience and more political connections than Lincoln, yet he secured the nomination. What is not obvious is the reason for the shift from the other candidates to Lincoln. What is clear is that a shift occurred among the delegates. They must have seen a quality in Lincoln that assured them that he was the man to lead the nation through this time of peril. The servant leader is not always the obvious choice for leadership. Often, it is not until after they have led that the servant leadership becomes obvious. Regardless of fate or destiny, Lincoln came away with the nomination that thrust him forward as the executive leader for a nation in crisis. Was Lincoln conscious of the fact that he was employing some of these characteristics? In other words, did he try to become the sort of leader that we would categorize as a servant today? I do not believe that Lincoln was conscious of the fact that he was a servant leader. In fact, many people who are in the realm of influence by a servant leader do not recognize that fact until the leader is gone. The residual effect of servant leadership is evidenced by the lasting change to the organization (or country in Lincoln’s case) and its people. His leadership kept this country intact and gave a voice to millions who had been silenced prior to their freedom. While the change was slow, they have had a profound impact on America, long after their introduction in the late 19th century. How do you go about researching a dissertation that applies historical insights to current theories about leadership? When putting together the components of this dissertation, I first felt it necessary to inform the reader of the evolution of leadership theory. In other words, the study of leadership is a relatively new discipline and our understanding of it has shifted from power to that of relationships. Moreover, early theories contended that leaders were born, not made. Further research disputed these findings. The next step was to uncover the basic principles that have outlined our understanding of the major leadership theories in the last century. It was necessary to touch on these theories so that Servant Leadership could be extracted from the group and set apart from other leadership theories. As my research into Lincoln’s presidency began, I had not concluded whether he would fit the description of a servant leader. Instead, Lincoln’s words and actions unfolded themselves for me. It was at this juncture that I focused my research on the preservation of the Union and the freeing of the slaves. From here, I used the lens of servant leadership to analyze and evaluate Lincoln during his years as President. This type of research is particularly challenging because your subject is deceased, and hence you are relying solely on their words (written and spoken) as well as scholarly analysis of others to draw your conclusions. Was there anything you learned over the course of your research that particularly surprised you? My research focused on two accomplishments of Lincoln’s presidency. However, I discovered another area that would be interesting for further research in his relationships and handling of the American people and the soldiers that he encountered. There is so much literature that points to his compassion and genuine fondness for others. He was particularly burdened by the trials of others. This area could further support my conclusion of his servant leadership. Do you think scholars have paid sufficient attention to this aspect of Lincoln’s leadership style? The lack of literature linking Lincoln to servant leadership leads me to conclude that scholars had never considered looking at him through this particular leadership lens. Furthermore, I believe that this leadership style is overlooked and may even be seen as “soft” in nature. While it may appear to the outsider as being a very passive way to lead, the opposite is true. servant leaders, like Lincoln, must be very sure of the path on which they are leading their organization. For Lincoln, he remained steadfast in his conviction of what he wanted for America and its people, even when he was criticized and the obstacles facing that vision seemed impossible. Additionally, servant leaders must be willing to maintain a reciprocal relationship with followers. That was often difficult for Lincoln to do with several members of his cabinet, but he believed in their abilities as leaders in their own right and thus gave them much lee-way to accomplish his vision for the country. What lessons do you think modern-day leaders can learn from Lincoln? 1. True leadership is not about power over others. It should be about change for the better regardless of the organization you are leading. 2. Leadership is a relationship with those in the organization. 3. Have a clear and concise vision for the direction you want to lead the organization. 4. Leaders need to surround themselves with the best “cabinet.” One person does not have all the answers. You must tap into the talents of others. Leaders can even learn from those they regard as a nemesis. 5. Search for ways to elevate those around you to a higher level of morality and ethics. 6. Communication is not only about talking; it is about listening as well. 7. Leadership is not for the faint of heart. It requires tenacity, courage and sheer grit to get the job done. 8. Leadership can be a very lonely position. The burdens of the organization begin and end with leaders. Have an outlet; seek times of renewal. 9. Leadership comes with trappings. Remember: this is not about you; the leader can be replaced. It is about the organization and the people within it as well as the impact your organization has on those around you. 10. Every leader will leave behind a legacy long after they are gone. Make sure your legacy is one that would make you proud. President Obama and his daughters recently toured the Smithsonian’s temporary Lincoln exhibit, which is open through May 30. The museum’s director discussed the visit on the National Museum of American History’s official blog. This is the anniversary of one of the more important achievements of Lincoln’s presidency. On May 20, 1862 Lincoln signed into law the Homestead Act, which allowed settlers to claim up to 160 acres of land in the American West. After improving their claims, paying a small fee, and residing on their land for five years, these settlers received clear title to these farms; farmers could also claim title after only six months by paying $1.25 per acre. At first glance, the Homestead Act seems to have little to do with the most notable concern of Lincoln’s administration, which was bringing the Civil War to a successful end. In reality, however, the issues of secession and western settlement were closely linked. It was the debate over whether slavery could be prohibited in the new lands opening up in the West that brought about the confrontation between North and South. The new Republican Party, of which Lincoln became a member, was a coalition of groups that opposed the spread of slavery beyond the limits set by the compromises of the early and mid-1800’s. The election of a Republican to the presidency in 1860 was therefore a threat to the institution’s expansion—and one thing about which opponents and proponents of slavery agreed was that the institution needed to expand in order to survive. The West was central to the controversy that brought about the Civil War. The secession of the South was a crisis for opponents of slavery, but it was also an opportunity for those who wanted a West for free white farmers instead of slave owners. With the South out of the way, free-soil politicians were free to establish western settlement in the way they had always wanted, as a haven for free white labor instead of territory in which slavery could expand further. The Homestead Act represented the kind of western settlement which Republicans like Lincoln had advocated in the 1850’s, a frontier which did not include the peculiar institution. It helped set the stage for the explosive growth of the West once victory in the war had been secured. In that sense, secession was a strategic blunder by proponents of slavery. By removing themselves from the theater of national politics, the secessionists allowed free-soil politicians to establish a West that fit their vision of America’s future—the same vision for which Lincoln argued when he walked onto the national stage in his debates with Douglas. In 1973 Arthur M. Schlesinger, Jr. first articulated the term “Imperial Presidency” to characterize the American presidents. The book, simply entitled The Imperial Presidency, chronicles the consistent growth of presidential power in the United States. Schlesinger associates the ever-increasing power of the American president with the conduct of war. The gradual accumulation of power, in Schlesinger’s view, is directly connected to threats to national security. Schlesinger’s book is certainly a response to the perceived abuses of presidential power by Lyndon Johnson and Richard Nixon during the Vietnam War. He was concerned that power had accumulated in the executive branch to allow presidents to respond unilaterally to threats to the nation’s security, at the expense of the legislative branch. The power to limit any particular president is vested in the American electorate. It is the power of the recall, through the election process every four years, which provides the ultimate restraint on presidential power. Recent events have placed the president in a position to apply unilaterally his presidential authority to make war without consultation with Congress as the founders had originally intended. The threat of violence against Americans has once again raised the question of presidential power and responsibility in the national consciousness. Americans and their elected representatives are willing to surrender personal liberties and limited government power in the face of foreign threats. James Madison may have stated it best when he wrote to Thomas Jefferson that “perhaps it is a universal truth that the loss of liberty at home is to be charged to provisions against danger, real or pretended, from abroad.”[ii] The concept of presidential war powers, and more particularly their application in times of emergency, arguably originated with Abraham Lincoln. Was Abraham Lincoln the first of the Imperial Presidents? He certainly used his constitutional authority as commander-in-chief to expand the parameters of the war powers to include intervention into areas traditionally reserved for civilian authorities. Lincoln believed that it was his sworn duty to preserve and protect the Constitution. In that capacity he assumed the authority that the president “shall take Care that the laws be faithfully executed.” In the face of the rebellion and insurrection Lincoln believed that he was well within his constitutional authority to suppress the rebellion and protect free government. He argued that if the established constitutionally elected government was to survive he had “no choice but to call out the war power.”[iii] Congress eventually approved Lincoln’s unprecedented actions to confront the emergency caused by secession and Civil War. Many of Lincoln’s contemporaries both inside and outside government accused him of abusing his presidential authority and even called him “the new dictator.” Lincoln found it necessary to call forth militia volunteers and authorize purchases of equipment and supplies to support them. As a military necessity Lincoln suspended the right of habeas corpus, the most fundamental constitutional protection of civil liberties. He declared a blockade of southern ports in violation of international law that threatened war with the European powers. He did all this and more without consulting Congress and justified his actions as emergency war powers. Lincoln expected that his unprecedented application of presidential power would be returned to Congress after the emergency. Undoubtedly, Lincoln (and most Americans) believed the rebellion would soon be reduced and the appropriate constitutional checks and balances reaffirmed. As events developed, Lincoln would increase rather than reduce his presidential authority to suppress political dissent, reorganize the military, and issue proclamations affecting the civilian population. Certainly, the most dramatic and far-reaching proclamation issued as a necessity of war was the Emancipation Proclamation. Lincoln used his presidential powers to control the reconstruction process, or at least substantially influence, through the use of the military, the restoration of national authority in the occupied territories. It was necessary for Lincoln to take unprecedented actions and at best expand the constitutional authority as president to suppress the rebellion and reunite the country. Abraham Lincoln was not the first of the Imperial Presidents, but he certainly was an early participant in an evolutionary process. The challenge for American democracy going forward is to maintain the balance between presidential and congressional power that the founders intended in the Constitution. The linchpin of American government is the executive, and mechanisms must emerge to control and restrain presidential power. At the same time, Americans cannot afford to significantly encumber or restrict the president’s ability to protect the country against extraordinary and unprecedented threats. As Schlesinger wrote in 1973, “American democracy must discover a middle ground between making the president Caesar and making him a puppet. The problem is to devise means of reconciling a strong and purposeful presidency with equally strong and purposeful forms of Democratic control.”[iv] Ultimately, the office will be defined by the character, integrity and judgment of the people selected for public service. We must have a president that sustains the Constitution and is sustained by the Constitution. History has proved that American democracy had nothing to fear from the presidency of Abraham Lincoln. Indeed it is doubtful that without his leadership and determination to preserve “government of the people, by the people and for the people,”[v]the country and the world would be a very different place. Americans should embrace a powerful presidency within the parameters of the Constitution. [i] Schlesinger, Arthur M. , The Imperial Presidency, Houghton Mifflin Co., 1973 Boston. [ii] Madison to Jefferson, May 13,1798. Visitors to the Abraham Lincoln Library and Museum encounter a sight that is both new and yet immediately familiar when they step inside—an artist’s model of the famous statue in Washington, D.C.’s Lincoln Memorial. Like its much larger cousin in the nation’s capital, the model is the work of Daniel Chester French, one of the most admired sculptors of the early twentieth century. The Lincoln Memorial Commission, created in 1911 and chaired by William Howard Taft, selected French to execute the statue for the Greek temple-style memorial building designed by Henry Bacon. 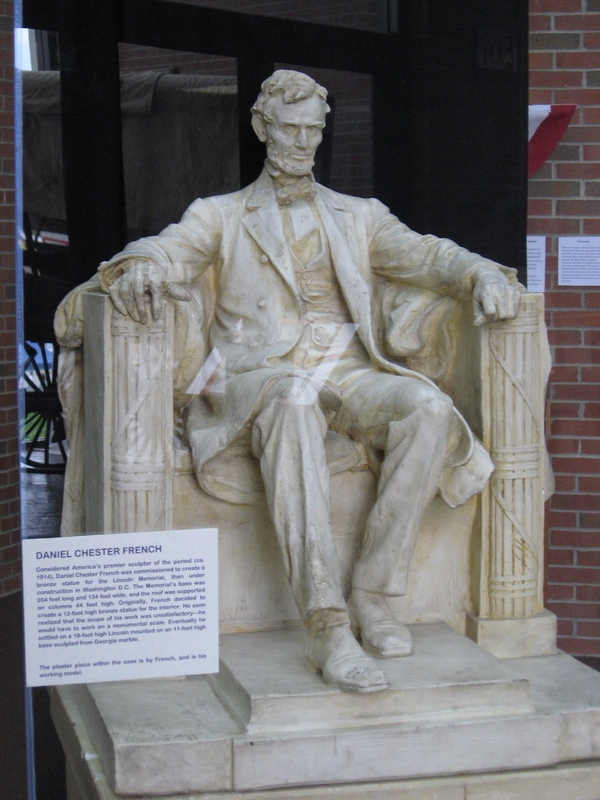 French and Bacon had previously collaborated on a bronze monument to Lincoln in Nebraska. 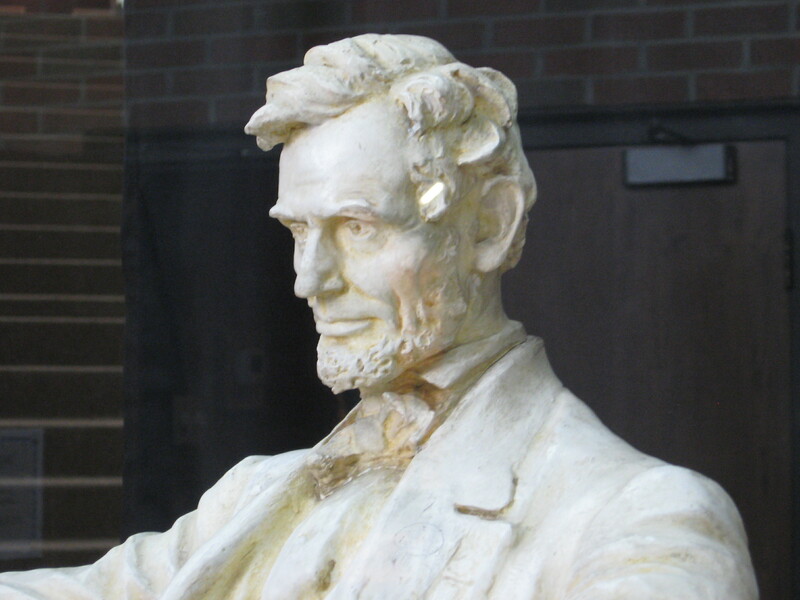 The statue’s face is reminiscent of the photographic portraits of Lincoln from 1863 and 1864. The commission originally planned for the full-size work to be in bronze, but French persuaded them to use marble instead, which adds to the classical feel of the memorial as a whole. One other classical influence in French’s work is visible in the pillars supporting the seat on which Lincoln sits. These pillars are shaped like fasces, bundles of rods used to denote strength, unity, and power since the days of the Roman Republic. Italian Fascists adopted this emblem because it evoked these same ideas, and in fact this was the source of the name “fascism,” but the same symbol continues to be used by many government entities and other organizations here in the U.S. and abroad. The Lincoln Memorial was actually the subject of some controversy when it was first conceived. Some critics thought a Greek temple with a monumental icon was too grandiose as a tribute to a man of the people who emerged from a humble background. When it was dedicated, though, it quickly became a popular D.C. destination, and today French’s statue is one of the most recognizable works of American art. Dr. Hubbard teaches courses on the United States, Lincoln, the Cold War, and foreign relations. 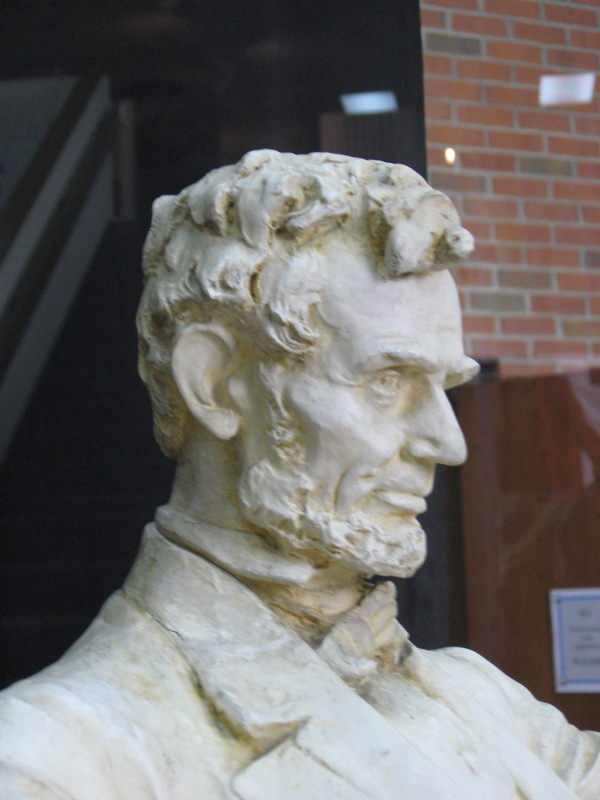 He has been active in integrating Lincoln studies into LMU’s Ed.D. program, crafting courses that draw on the lessons of Lincoln’s life and policies to build up tomorrow’s emerging leaders and administrators. The inaugural class in this program nominated Dr. Hubbard for the Houston Award, and also received their doctorates at this year’s graduation ceremony. The same charge of deliberately leading the country into war is sometimes leveled at Franklin D Roosevelt. In Roosevelt’s case the question was how to respond to the aggressive military tactics of the Empire of Japan. In an effort to force Japan to refrain from further aggression in Asia, Roosevelt placed an embargo on military supplies and moved the Pacific Fleet from San Diego to Pearl Harbor. These actions form the basis of the charges that Roosevelt forced Japan to bomb Pearl Harbor on December 7, 1941. Neither Abraham Lincoln nor Franklin Roosevelt wanted war. Both presidents responded to unprovoked attacks on the country. Their critics continue to argue that a more passive response to the events preceding the outbreak of hostilities could have avoided the two deadliest wars in American history, but Abraham Lincoln and Franklin Roosevelt were astute politicians and understood that Americans would support a forceful response to any threat to the security and preservation of the nation. The two wars were different—one was a Civil War between Americans and the other a world war involving people all over the globe—but the decisions of Abraham Lincoln and Franklin Roosevelt significantly changed the world in which we live. In 1864 Lincoln wrote, “I claim not to have controlled events, but confess plainly that events have controlled me.” The same could be said of Roosevelt. The events and circumstances left little choice for either President and both decided to take the nation into armed conflict.